Responding to mechanical cues and producing mechanical forces is central to survival and adaptation of all organisms. To do so, cells dynamically organise a large number of membrane proteins into functional nanoscale structures. Due to their multiscale nature, such processes are challenging to resolve with current experimental techniques and are too complex for detailed molecular simulations. Coarse-grained computer simulations, rooted in statistical mechanics and soft-matter physics, can be of great value in determining how functional protein nanostructures operate. Here I will discuss cooperative gating of mechanosensitive membrane channels, and the production of mechanical forces by elastic filaments adsorbed on membranes, using minimal coarse-grained models. I will provide quantitative predictions for cooperative action of bacterial mechanosensitive channels, from molecular to cellular scales. 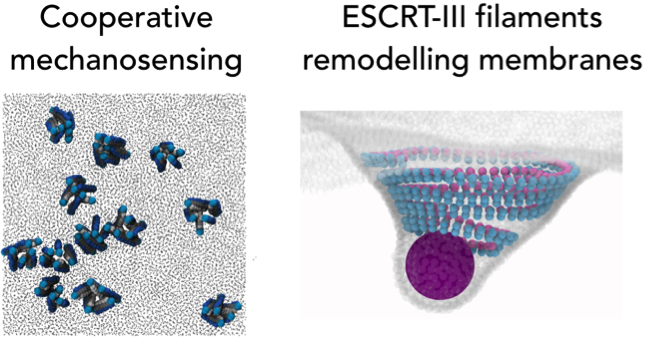 I will propose how geometrical transitions of ESCRT-III filaments can remodel and sever membranes of various shapes and topologies, creating membrane cones, tubes, buds, and dividing tubular and spherical membranes. Beyond their biological context, our findings can also guide the design of artificial structures that mechanically sculpt cells and sense mechanical forces at the nanoscale.